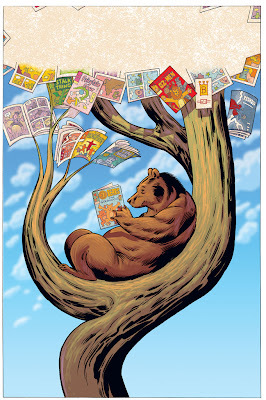 Aside from my proper job, I've also been managing the odd little extra bit here and there - one of the more fun things has been colouring Mark Buckingham's poster for this year's Expocomic festival in Madrid. Publicity work is always very different from comics. In the comics industry, the artist's work is the finished product; in publicity work, the illustrator is a collaborator, providing raw material to be processed by designers and other hands in order to become the finished product. It's always interesting to see what becomes of the work as a result. At first I was a bit startled by the amount of cropping and post-processing they'd done to the original file (see below), but on reflection I think it works well. With the integrated panels and dot-screening, there's certainly more of a "comic-related" feel to the final layout. The original colour version of the poster. Art by Mark buckingham, colours by me. 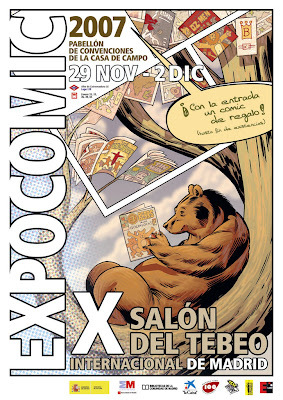 Each year's poster is based on the symbol of Madrid; the bear and a tree called the Madroño. As you can see, Mark's original drawing (above) is a much wider shot and my original colours were bolder. The blank space at the top was to allow for a banner.